A schooner /ˈskuːnər/ is a type of sailing vessel with fore-and-aft sails on two or more masts. The most common type has two masts, the foremast being shorter than the main. While the schooner was originally gaff-rigged, modern schooners typically carry a Bermuda rig. The first detailed definition of a schooner, describing the vessel as two-masted vessel with fore and aft gaff-rigged sails appeared in 1769 in William Falconer's Universal Dictionary of the Marine. According to the language scholar Walter William Skeat, the term schooner comes from scoon, while the sch spelling comes from the later adoption of the Dutch spelling ("schoener"). Another study suggests that a Dutch expression praising ornate schooner yachts in the 17th century, "een schoone Schip", may have led to the term "schooner" being used by English speakers to describe the early versions of the schooner rig as it evolved in England and America. The Dutch word "schoon(e)" means nice, clean, good looking, sexually arousing, or horny..
A popular legend holds that the first schooner was built by builder Andrew Robinson and launched in Gloucester, Massachusetts where a spectator exclaimed "Oh how she scoons", scoon being similar to scone, a Scots word meaning to skip along the surface of the water. Robinson replied, "A schooner let her be." The launch is variously described as being in 1713 or 1745. Naval architects such as Howard Chapelle have dismissed this invention story as a "childish fable", but some language scholars feel that the legend may support a Gloucester origin of the word. Although mostly associated with North America, schooners were first used by the Dutch in the 16th or 17th century. They were further developed in North America from the early 18th century, and came into extensive use in New England. Schooners were popular in trades requiring speed and windward ability, such as slaving, privateering, blockade running, and offshore fishing. In the Chesapeake Bay area several distinctive schooner types evolved, including the Baltimore clipper, bugeye, and pungy. Schooners were also popular among pirates in the West Indies during the Golden Age of Piracy, for their speed and agility. They could also sail in shallow waters, and while being considerably smaller than other ships of the time period (such as frigates and galleons), they could still hold enough cannons to intimidate merchant vessels into submission. Schooners first evolved in the late 17th century from a variety of small two-masted gaff-rigged vessels used in the coast and estuaries of the Netherlands. Most were working craft but some pleasure yachts with schooner rigs were built for wealthy merchants. Following the arrival of the Dutch Stadtholder William of Orange on the British throne, the British Royal Navy built a royal yacht with a schooner rig in 1695, HMS Royal Transport. This vessel, captured in a detailed Admiralty model, is the earliest fully documented schooner. Royal Transport was quickly noted for its speed and ease of handling, and mercantile vessels soon adopted the rig in Europe and in European colonies in North America. Schooners were immediately popular with colonial traders and fishermen in North America with the first documented reference to a schooner in the United States appearing in Boston port records in 1716. North American shipbuilders quickly developed a variety of schooner forms for trading, fishing and privateering. Essex, Massachusetts, was the most significant shipbuilding center for schooners. By the 1850s, over 50 vessels a year were being launched from 15 shipyards and Essex became recognized worldwide as North America's center for fishing schooner construction. In total, Essex launched over 4,000 schooners, most headed for the Gloucester, Massachusetts, fishing industry. Bath, Maine, was another notable center, which during much of the 19th century had more than a dozen yards working at a time, and from 1781 to 1892 launched 1352 schooners, including the Wyoming. Schooners were popular on both sides of the Atlantic in the late nineteenth and early twentieth centuries, long dominating yacht races such as the America's Cup, but gradually gave way in Europe to the cutter. Schooners were used to carry cargo in many different environments, from ocean voyages to coastal runs and on large inland bodies of water. They were popular in North America. In their heyday, during the late 19th century more than 2,000 schooners carried on the Great Lakes. Three-masted "terns" were a favourite rig of Canada's Maritime Provinces. The scow schooner, which used a schooner rig on a flat-bottomed, blunt-ended scow hull, was popular in North America for coastal and river transport. A Bermuda rigged schooner typically has four triangular sails: a mainsail, a main staysail abaft the foremast, plus a forestaysail and a jib (or genoa) forward of the foremast. [clarification needed] An advantage of the staysail schooner is that it is easily handled and reefed by a small crew, as both staysails can be self-tacking. The main staysail will not overlap the mainsail, and so does little to prepare the wind for the mainsail, but is effective when close-hauled or when on a beam reach. Although the main staysail has less area than an equivalent gaff sail, a loose-footed "fisherman" may be flown above the main staysail to maximize drive in light airs. The fisherman's staysail, a four-sided fore-and-aft sail, is not strictly a staysail, but is clewed abaft the foremast. An alternatively light-air sail is a triangular mule. Sailing vessels with a single mast will typically be sloops or cutters, either with a Bermuda or gaff mainsail. There is little justification for the cost and complexity of a second mast unless the vessel is reasonably large, say above 50 feet (15 m) LOA. If a vessel's size requires a second mast, the sail plan will usually be a schooner, ketch or yawl, all of which are fore-and-aft rigged, although the "topsail schooner" variant carries one or more square topsails on its foremast. The two-topsail schooner variant carries square topsails on both the mainmast and the foremast. The schooner may be distinguished from both the yawl and the ketch by the disposition of its masts, and thus the placement of the mainsail. On the yawl and ketch, the mainsail is flown from the forward mast, or mainmast, and the aft mast is the mizzen-mast. A two-masted schooner has the mainsail on the aft mast, and its other mast is the foremast. Compared to a single-masted vessel, all the two-masted vessels can have a lower centre of pressure in the sail plan. Although the ketch and, to a much lesser extent, the yawl are more popular than the schooner in Europe, the schooner is arguably more efficient. The schooner can carry a larger sail area, because of its much larger mainsail and the effective sail(s) between the masts. Also, in a schooner, all the sails work together in a complementary fashion, optimising airflow and drive. By contrast, on a ketch, or especially a yawl, the mizzen sail provides proportionately less power, being smaller than, and frequently blanketed by, the mainsail. The ketch however offers advantages in sail handling in poor weather. 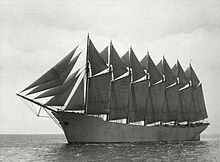 Multi-masted staysail schooners usually carried a mule above each staysail except the fore staysail. Gaff-rigged schooners generally carry a triangular fore-and-aft topsail above the gaff sail on the main topmast and sometimes also on the fore topmast (see illustration), called a gaff-topsail schooner. A gaff-rigged schooner that is not set up to carry one or more gaff topsails is sometimes termed a "bare-headed" or "bald-headed" schooner. A gaff schooner may carry a square topsail atop the foremast. A schooner with no bowsprit is known as a "knockabout" schooner. A "cat-rigged" schooner not only has no bowsprit but has no headsails, and has the foremast set as far forward as possible. While schooners were initially defined as having two masts, three-masted schooners were first introduced around 1800. In the late 19th century, additional masts were added as schooners were built with as many as six masts (e.g., the wooden six-masted Wyoming) or seven masts to carry a larger volume of cargo. The only seven-masted schooner, the steel-hulled Thomas W. Lawson, was built in 1902, with a length of 395 ft (120 m), the top of the tallest mast being 155 feet (47 m) above deck, and carrying 25 sails with 43,000 sq ft (4,000 m2) of total sail area. It was manned by a crew of only sixteen. A two- or three-masted schooner is quite maneuverable and can be sailed by a smaller crew than some other sailing vessels. The larger multi-masted schooners were largely a cost-cutting measure introduced towards the end of the days of sail. Adventure, 1926 design by Thomas McManus as a "knockabout" schooner. When she retired in 1953 she was the last American dory fishing trawler left of what was a prosperous and numerous fleet of Grand Banks fishing schooners. 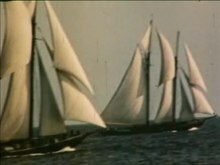 American Eagle, the last schooner to be launched from Gloucester in the 1930s – 14 or more times winner of the Gloucester Schooner Festival races, only topped by the new, steel hulled Columbia. Columbia (schooner), 1923 the final development of the Gloucester fishing schooner design. Lost with all hands in August 1927. A steel replica was built by Eastern Shipbuilding in Panama City, Florida and launched in August 2014. USS Enterprise, fired the first shots in the First Barbary War. Later rebuilt as a brig and fought in the War of 1812. Grace Bailey (formerly Mattie), built in 1885 as a coastal schooner, she began running passengers in 1939 out of Camden, Maine and has been since, making her the oldest continuously operated sail excursion vessel in the United States. Lewis R. French (schooner), currently the oldest schooner in the US. Rich Harvest, a 72-foot ferrocement staysail schooner, infamous as the "offshore off-licence"
Wolf (schooner), flagship of the Conch Republic. She is a steel hull Merritt Walter design. Zodiac, 1924 William Hand Jr. design. Four-masted schooner, Margaret Todd under sail. ^ Jamieson, John (1825). Supplement to the Etymological Dictionary of the Scottish Language. Edinburgh University Press. p. 349. ^ Babson, John. History of the Town of Gloucester, Cape Ann, including the town of Rockport. 1860. p. 251–252. ^ The Oxford English Dictionary doubts the truth of the anecdote but endorses the likely origin of the word in Gloucester, Mass: '...The anecdote, first recorded, on the authority of tradition, in a letter of 1790 (quoted in Babson Hist. Gloucester, p. 252), looks like an invention. The etymology which it embodies, however, is not at all improbable, though there seems to be a lack of evidence for the existence of the alleged New England verb scoon or scun, ‘to skim along on the water’. Compare Scottish (Clydesdale) scon, ‘to make flat stones skip along the surface of the water’, also intr. ‘to skip in the manner described’ (Jamieson). The early examples afford strong ground for believing that the word really originated about 1713 in Massachusetts, and probably in the town of Gloucester.' "schooner, n.1". OED Online. March 2013. Oxford University Press. ^ 'The evidence of two or three old prints seems to prove that the type of vessel now called ‘schooner’ existed in England in the 17th cent., but it apparently first came into extensive use in New England.' "schooner, n.1". OED Online. March 2013. Oxford University Press. ^ Cunliffe, Tom (1992). Hand, Reef and Steer. Sheridan House. p. 21. ISBN 1-57409-203-0. ^ Reed, Parker McCobb. History of Bath and environs, Sagadahoc County, Maine: 1607–1894. Portland, Maine: Lakeside Press, 1894. page 179. ^ Cunliffe, Tom (1992). Hand, Reef and Steer. Sheridan House. p. 22. ISBN 1-57409-203-0. Wikimedia Commons has media related to Schooners. Wikisource has the text of the 1921 Collier's Encyclopedia article Schooner. "Schooner" . Encyclopædia Britannica (11th ed.). 1911.